June means warmer weather; afternoons sitting on the deck, luxuriously sipping an iced beverage while I read a book and think about my week….. wait, what?!?! That doesn’t sound like my June afternoons. That is because June is the busiest month for my family. Some say December is their busiest month, but June ranks way above. During the month of June, we 6 family birthdays, wind ups for the kids yearly activities, soccer, baseball and gearing up for the end of school. This year, I am even expecting the arrival of my 12th niece/nephew. Because June is so crazy for me, my afternoons are generally spent running errands and getting as much stuff done as I can before the kids come home from school. My mornings, however, are spent with some time for me that encourages me to live the rest of my day out with some good energy. I take time 4 mornings a week to workout and to do something good for my body. During these crazy afternoons though, instead of taking the time to sit on my deck relaxing and sipping an iced drink, I need something that will get me through the day and that is quick and easy. These tall cans of refreshing flavors provide perfect energy for on-the-go days. Grab one as you are heading out the door, or pick one up in the store while shopping. The Strawberry Lemonade and the Raspberry Pomegranate are my favorite flavors and hubby enjoyed the Strawberry Lemonade too. On the rare occasion that I do have a few minutes to sit down on the deck and enjoy a nice iced beverage, Starbucks Refreshers are perfect for that too! 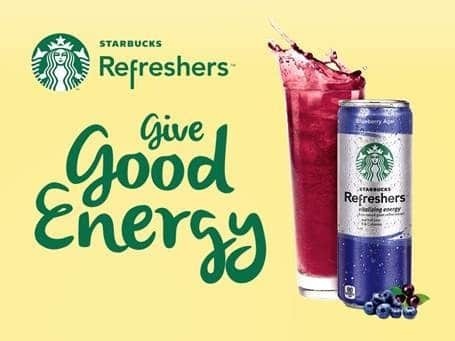 Canadians are invited to join in sharing Good Energy by following the Starbucks Refreshers Give Good Energy Pinterest Board. The Pinterest Board showcases various inspirational quotes, which consumers can “like,” Pin to their personal boards and share with their friends. Receive an automated weekly boost of Good Energy with inspirational quotes delivered directly to mobile devices with the Starbucks Refreshers Mobile Texting Application. Consumers can subscribe by texting GOOD to 393939 (or POSITIVE in Quebec) to receive weekly inspirational texts on Mondays at 3 p.m. (local time) to energize their day. Throughout the summer, Starbucks will be giving out nearly half a million samples of ready to drink Starbucks Refreshers™ at various major events in Toronto, Vancouver and Montreal so consumers can fuel up and share good energy too! 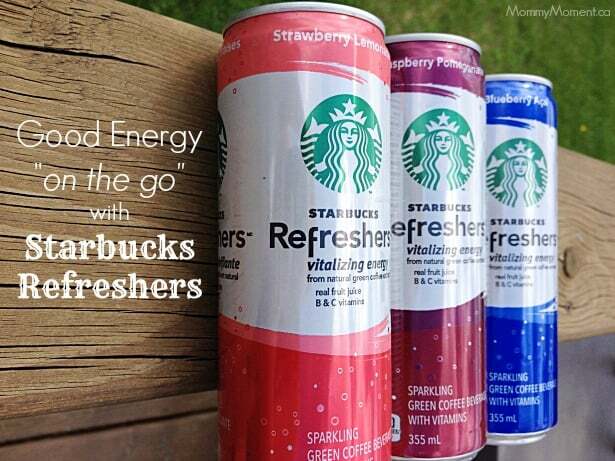 1 CANADIAN Mommy Moment reader will WIN a Starbucks Refreshers Good Energy On-The-Go Gift Pack valued at $150!! To enter, leave a blog post comment telling us what you do to bring good energy into your life. I have children. I’m serious here, they bring a wonderful amount of good energy into my life. one of the ways I try to bring good energy to my life is to really think about how I say things, negative talk usually can have negative energy, stress and affect your relationships. I spend time with my family. You get energy from the love they have for you! I exercise to bring good energy! Get outside a lot and enjoy the beauty of the mountains and lake in BC! Positive thinking does wonders and brings more good energy (and good karma) to you! When I have time I like to meditate at the ocean front! De-clutter the house, and also listen to happy fun music. If I am honest nothing right now! I’ve worked very hard at not taking things personally….and enjoying everyday I have because its a beautiful thing. Spend me time to focus on relaxing and less stress, it gives me positive good energy in my life. Love to go camping in the mountains and relax with the family! Trip to the lake gives me good energy for sure. I go out and walk a lot, do gardening. Anything to get myself outside and enjoy the nice summer days. I always start my day off in quiet, I make a cup of coffee and check my emails way before anyone else in the house get ups. I try to counteract negative thoughts and words with positive ones. I do my gratitude list every morning. I try to stay positive and meditate! Go play outdoors with my kids – road hockey, baseball, soccer. I have two boys so I have to have lots of energy! Think positively and my son makes me laugh. We got a treadmill desk at work a few weeks ago and I am using it every day now! No excuse not to get some exercise every day now! I Walk a lot to bring good energy! I get creative, whether it’s sewing a quilt, photographing a gorgeous sunset, or grabbing my sketchpad and going on the patio to do some drawing. Take my dog for a long walk! I exercise everyday and drink lots of water!! I like to surround myself with positive people! I go for a walk ,and try to relax my mind! A positive attitude and regular exercise. Wake up earlier than the kids and spend time with God. Exercise, eating healthy and spending time in the garden. I do it by trying to thing positive and give people the benefit of the doubt. I eat lots of fresh fruits and veggies! Loving my family brings good energy! Getting adequate sleep gives me energy. I believe in positive thinking, I think it brings lots of energy to me. My good energy comes from walks in the woods with our dog. Plus we just got a kitten…way too much good energy. I try to eat healthy and drink lots of water. Getting enough sleep is important too! I get my good energy from my 2 year old daughter…she cracks me up so much, it’s impossible to be in a bad mood! I get my sleep, try to eat healthy and remain positive. Thanks for sponsoring this great giveaway and for the opportunity to participate. I try to see the humor in life. You can’t have negative energy when you’re laughing! Playing with my kids! Their innocence and their love of everything gives me good energy! Pay it forward as often as possible! I have been blessed and try to pass it on. i take time for myself and do things i like to do. I always try to think positive and remove negative people in my life. lots of water and I eat well! I enjoy spending time with my daughters and find that brings good energy to my life! I try to take some time every evening just to sit by myself and reflect, and get some quiet. My kids are so loud, and its always so busy and hectic, that taking that bit of time at night refreshes me. I like to take my dogs for a walk. To bring good energy into my life, I read inspirational quotes, think and speak positively. I look for the positive in every situation and focus on the good. Greet each day with an open mind and an open heart. I do favours for friends and family. I bless those around me!! I like to go for walks, hikes, and bike rides. I try to get out and go for a walk with my kids every day. It always feels great. I try to be spontaneous! I fresh fruit smoothie every day perks me up. I spend time with my children or relax with a good book. I try to meditate and take a little time to myself each day. Volunteering for causes close to my heart energizes me! I take a quick nap in afternoons. I exercise and drink lots of water. I go for a long walk every day to bring energy into my life. I just take time outs so I dont become too stressed or have too much negative energy. Sometims I even just walk away from a situation that is giving me bad vibes. I try to focus everyday on helping those around me, not only advancing my own desires. I try to surround myself in positive people. And head to the playground with my son and lots of bubbles whenever I feel down. I try to treat others as I would like to be treated. I try to send positive energy into the world. I dont drive so I walk most places. I also try to exercise every day. I workout daily. I especially love adding yoga workouts for positive energy. I try to stay positive. It isn’t easy. I take CBT classes (Cognitive Behavioural Therapy). These classes saved my life. A good nice sleep and eat well. I always try to put a little good in every persons day i’m part of. I listen to music and spend time with people i love. Go outside and breathe in the fresh morning air. I go for a run in the mornings. …start the day with devotions and a prayer. I surround myself with loved one’s everyday and also have inspirational wall art throughout our home. IN order to give me good energy, I try to walk and do other exercises almost every day and I try to spend some time each day in meditation. I get lots of good energy by volunteering with homeless animals! I try to be pleasant to everyone and send out good vibes. I have kids and a dog , they bring me good energy ! I try to be more patient with people. Biking always does the trick or going to the park with my daughter! I really try not to get stressed out over the small stuff. get lots of sleep, and make my daughter go to bed on time too. yoga, meditation, deep breathing, and healthy eating! I try to be patient, and I also take time to meditate while sitting outside on a nice grassy patch. I listen to great music to bring good energy. I take long walks with my dog! I exercise daily. ALways brings me good, natural energy. We bring in new energy by exercising and laughing! try to get a good night sleep! 5-6 small, balanced meals throughout the day, and a walk outside when possible. thanks. I get more energy by drinking coffee…lots of coffee!! I am friendly and courteous to others, hoping that that will make their day a little bit happier, which they can in turn pass on to someone else. I eat a healthy breakfast and take a daily vitamin supplement. Coffee usually helps with the good energy. I try to get fresh air from outside as much as I can! my family keeps me energised. thanks. I spend lots of time with my family. I think it’s the little things that count so I put out good energy by being polite, holding doors, donating food, etc. I bring good energy into my life by surrounding myself with positive people. I keep busy by volunteering and helping out whenever I can. I think about and write out what I am grateful for. I treat people kindly and how I want to be treated. Being polite and positive goes a long way. spend time with family and friends and going for walks. I hang around positive people. I try to spend time relaxing each morning and thinking about the positive things I have in my life. I notice a huge increase in energy when I juice. Even 1 green juice/day increases my energy. getting proper amounts of sleep, I also love taking walks it clears the mind! I try to keep a positive attitude! I try to go for a walk everyday. I volunteer with Growing Chefs, teaching kids how to grow their own food and cook with it, and I volunteer at a senior’s centre, where I cook hot meals. I exercise with weights and do Pilates for energy. Stay positive and do good to others. You get what you put out there, so live your life as clean as possible. I try to stay positive and keep healthy. I try to always “see the sunshine in the clouds”, try to see the positive side of things, and smile. When I walk outside I try to focus on my surroundings not the things going on inside my head…in other words I try to be more mindful. I try to surround myself with good people! Sleep when I can and yoga. I start my day off with walking my doggy and he brings me positive energy to start my day. Corny as it may sound – laughter is the best medicine. Times are chaotic and hectic and somehow the time to be relaxed and just laugh is far and few between – life got so serious. So each day I go to ahajokes(dot)com and choose 1 or 2 which make me burst out in giggles and then I said them to family and friends. Sometimes when times permits I like to post them on Facebook. Small gesture but I am sure they are cherished. Go to the gym – it really helps! 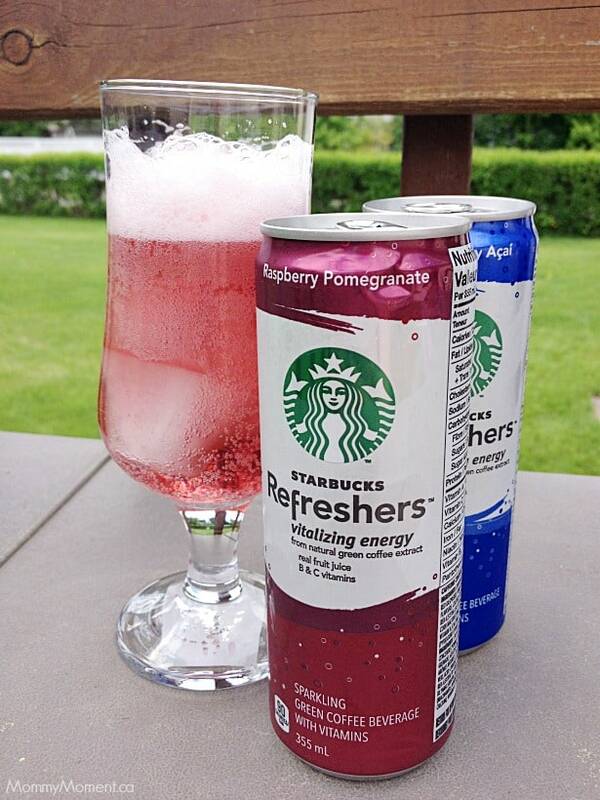 It would be great to win a Starbucks Refreshers Good Energy On-The-Go Gift Pack . In response to your question of What do you do to bring good energy into your life? I try to be nice to others and help someone if i can and listen to my favorite music. I take a cuddle from my lovely girls, let the sun warm my face, and have something delicious to drink! Lots of water, sleep (when I can get it) and exercise. To bring good energy into my life, I try to exert good energy into the lives of others by being polite and courteous. I try to pray everyday! I try to be a positive person all the time to have positive energy in m life. how I bring it in, I try not to sweat the small stuff, no use freaking out over something broken because its not going to fix it. I try to be positive and give myself time to relax every day. I do things that make me happy like playing with my cats or going for walks. I try to eat well, it makes me feel better every day. I open the windows to clear the air and take walks with my daughters. I am a part time student and as much as it takes me to sit down to accomplish something, nothing feels better after I have. Which motivates me for the next day etc. 1 more week after tonight and I am off for a month! That brings me good energy! I go for a long walk every morning and fill my lungs with fresh air. First of all I always start the day off with a smile when I get out of bed, then my day starts off great and go from there. Try to eat healthier by eating fruits and vegetables when possible. I bring energy into my life by exercising and drinking lots of water. Of course a good cup of coffee in the morning always wakes me up too. I try to be a good person always. I like to do stretching exercises everyday. Just simple ones are good enough. I stay within the bounds of good sensible living, making good choices , find time to help in the community and my family. Since I Retired, I haven’t got the Energy that I used to have, so I could use something to Give me More Energy. Doing good deeds for others brings positive energy to my life. I try to follow the old standard golden rule of “do unto others.” It’s amazing to watch a small gesture brighten someone’s day! I spend time outdoors and get fresh air. More water, more sleep and more exercise.